There are elections for governor in 36 of the 50 states this year. 26 of those offices are held by Republicans and nine by Democrats, with one independent in Alaska. Only half of the Republican incumbents are running; all the departing governors, except for Idaho's Butch Otter, are term-limited. On the Democratic side, five of the nine incumbents are running; two of the four departures are due to term limits. 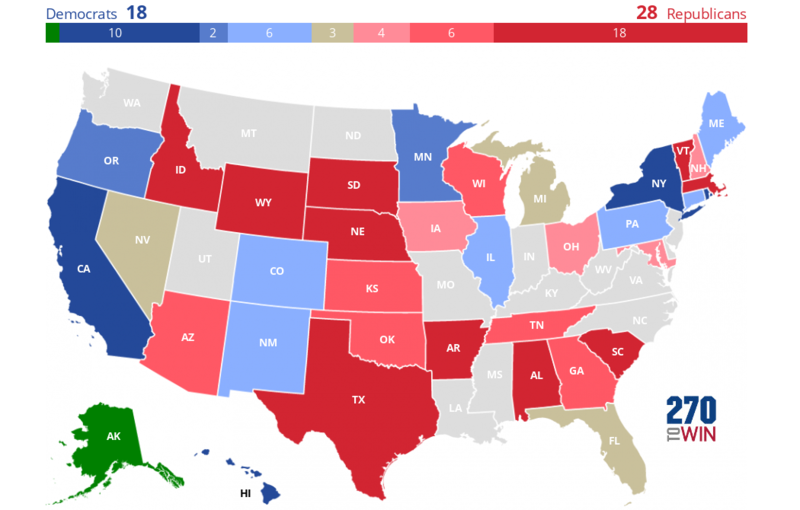 Overall, as of January 16th*, Republicans hold 33 governorships and Democrats 16, with one independent. This year's gubernatorial elections will take on more national importance than usual as the governors elected this year will be in office^ when redistricting occurs after the 2020 Census. In most states, the legislature draws the district lines, while the governor has veto power. With heightened interest in these gubernatorial races, we've begun a process of upgrading the Interactive 2018 Governor Map. The first part of that, saving and sharing maps via social media, is now live. As with the presidential and Senate maps, click the 'Share Map' button that will be visible below the map (after you make one or more changes). Once you click that, the social media buttons below the map will become active, and you can share your specific projection via social media or email. The map image can also be embedded on a web page via the rightmost button. In the table below, we've embedded the current race ratings from Sabato's Crystal Ball, The Cook Political Report and Inside Elections. Select any of them to use as a starting point for your projection. These are the default projections when you reset the map. We'll be adding other starting views in the weeks ahead. Inside Elections uses a 'tilt' rating between 'toss-up' and 'lean'. Illinois is 'tilt Democratic', while Ohio is 'tilt Republican'. We show these as 'lean' on the map below. Alaska is 'lean' independent. * Democrat Phil Murphy replaced Republican Chris Christie on this date. ^ Assumes no early departures due to death or resignation. New Hampshire and Vermont have two-year terms; those seats will be contested again in November, 2020. It is a moot point with Vermont, as the state has one at-large congressional district.